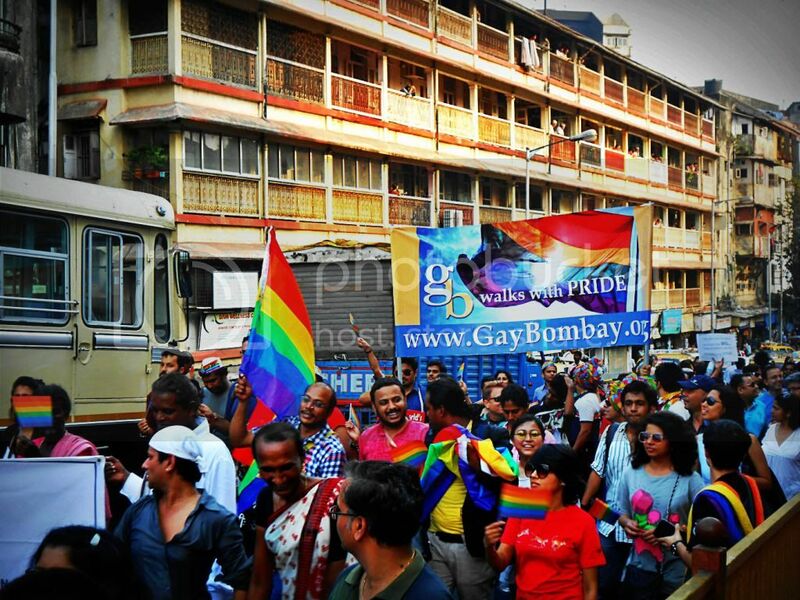 “I was feeling flustered seeing the large number of gay men and women around me as I realized I belong to the minority here. Then it struck me! This must be what gay people go through each day and it seriously takes strength to face that and carry on. 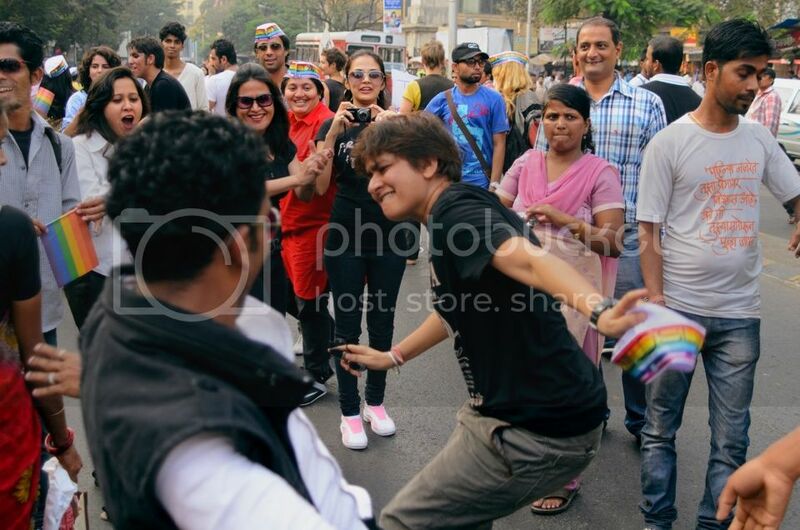 That realization washed away whatever awkwardness I was feeling and gave me the assurance to march for equality.” These are the words of Ankit, 23, one among the many straight folks who participated in this year’s Queer Azaadi Mumbai gay pride march which was held on Feb 2nd. 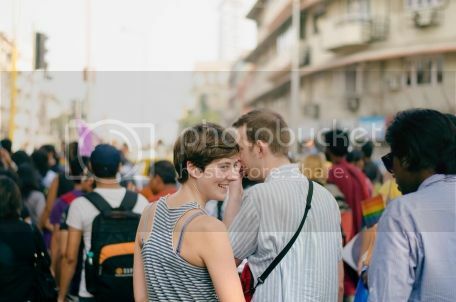 More than 2500 turned up for the pride march which also included considerable percentage of straight people to show their solidarity for their LGBT friends / relatives and to support the cause of equality. Mansi, a straight supporter opined we should celebrate our lives for being born as humans and there should be no divide amongst us. Many such sentiments were shared before the commencement of the procession. There was a mother who came for her gay son, a sister for her lesbian sister, but the most touching one was of the two sisters who were there to show support for their lesbian mother. 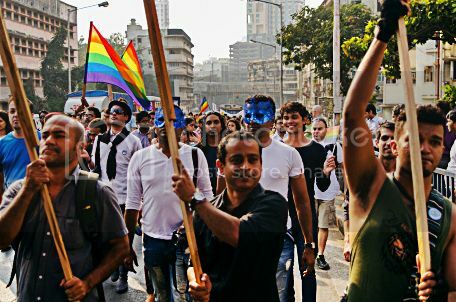 Queer Azaadi Mumbai (QAM) is an umbrella of 20 key non-governmental LGBT support groups and organizations, institutionalized in 2008 to conduct the annual gay parade in Mumbai asking for equal rights of LGBTIQ (Lesbian Gay Bisexual Transgender Intersexed Queer) individuals. 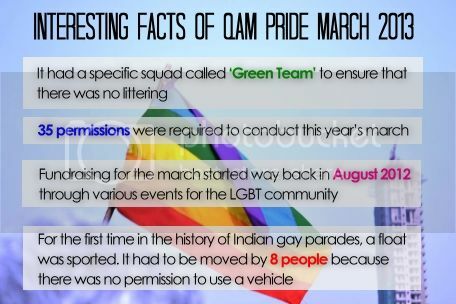 The first QAM parade in 2008 demanded reading down of IPC 377 that criminalized homosexuality and saw a turnout of about 500, a pleasant far cry from 15 during India’s first gay pride march (called the ‘Friendship March’) when held at Kolkata in 1999. 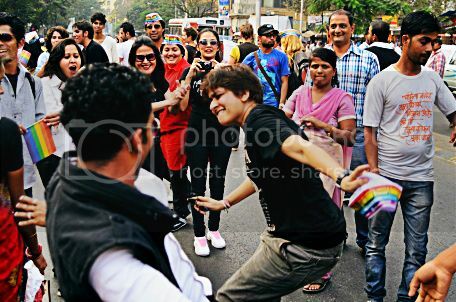 However this year’s edition ran into a bit of chaos when the Mumbai traffic police denied permission. But thanks to the persistent efforts of QAM organizers, the police reconsidered their decision and the necessary permissions were in place just 5 days before the designated day. The organizers revealed that a horde of 35 permissions were required to carry on an event of this massive scale. 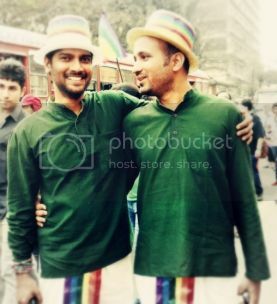 Even though India embarked upon a post IPC 377 era with the landmark judgement by Delhi High Court decriminalizing homosexuality in July 2009, LGBT community is still at the receiving end of severe homophobia and is being subjected to various social stigmas. Even when World Health Organization declassified homosexuality as a mental illness in May 1990, many still view gay men and women as a ‘diseased’ lot. Parents look out to ‘cure’ their homosexual sons and daughters so that they can be fit into the customary societal norms of getting them married and bringing forth offsprings. There have been many instances of forced marriages of gay individuals which have ultimately resulted in divorces or even worse, led them to depression and suicides. 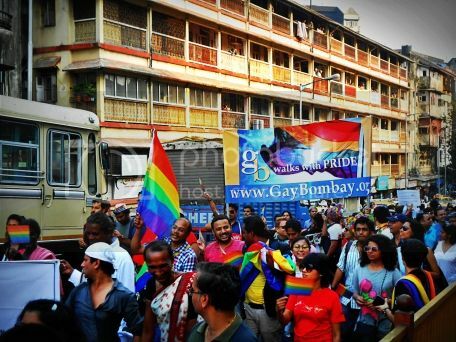 Many sections of media and mainstream cinema still project homosexuality in bad taste with stereotypes and violate the private lives of an already marginalised community. 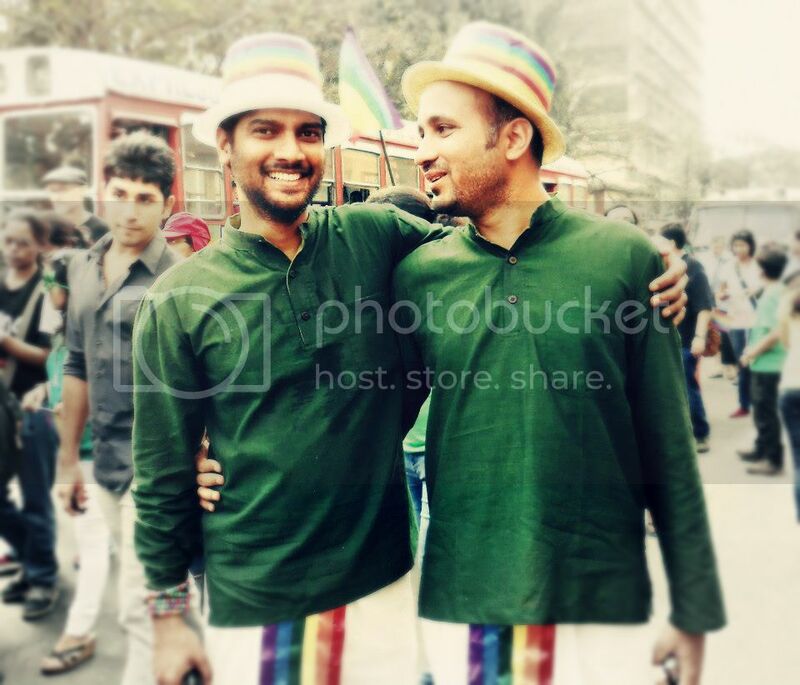 Gay people are still being bullied and discriminated at educational institutes and work places. To highlight these plights, gay parades are now being organized at various cities as well as to force the public to take notice that homosexuality and transsexuality are very much existent in India. Perhaps one of the positive transitions that have come about is that people no longer feel the need to wear masks indicating a stronger self acceptance and confidence of who they are. 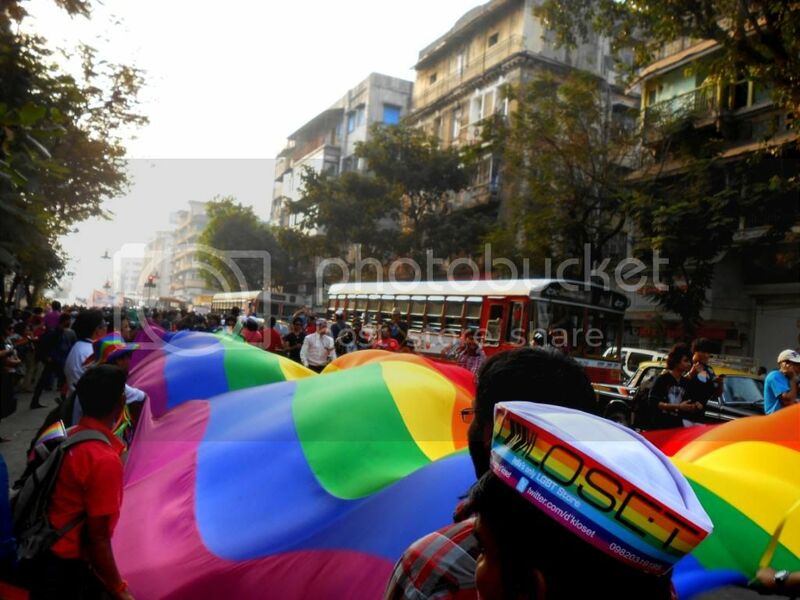 This was my very first gay parade and even I didn’t feel like hiding my face though there were scores of shutterbugs capturing the colourful visuals of the carnival. 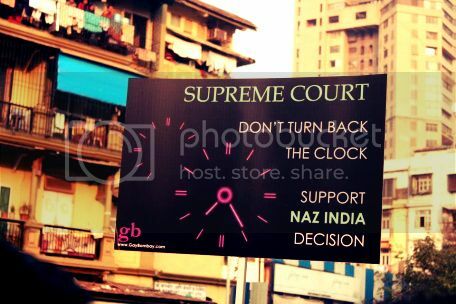 The procession saw sarcastic, thought provoking and funny banners and slogans. 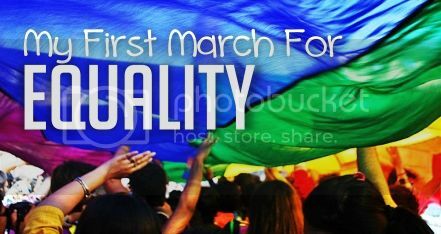 “1.. 2.. 3.. 4.. Homophobia out the door! 5.. 6.. 7.. 8.. Don’t assume your child is straight!” - a group of ladies shouted. The dhol nagada gave a spirited and vigorous ambiance of festivity. People danced and shouted slogans while the procession limped forward as curious onlookers watched from the pavements and nearby buildings. I felt a sense of blissfulness for being part of a movement, of a cause that I deeply believe in. Those 65 minutes of walk were in fact life changing moments for me. It was the first time I didn’t care what other people thought about me, I didn’t care if I was seen by a colleague or a friend, I didn’t care if I got clicked by the media. I even posted on my Facebook that I was walking the gay pride march so that my colleagues and friends could see. It is one thing to read or watch the pride parades, but it is an altogether different experience when you participate in one.. exhilarating to say the least! Thanks Praful Baweja, Niyas Khader and Gaylaxy Magazine for helping me with your photographs.